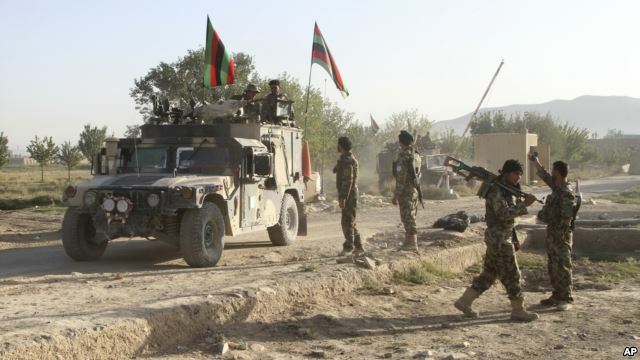 Taliban insurgents have stormed a prison in eastern Afghanistan, releasing hundreds of prisoners. The well-organized attack began with a suicide car bombing that allowed other rebels to get into the prison, said Mohammad Ali Ahmadi, deputy provincial governor of the eastern Ghazni province. Afghan officials say there were a total of 436 prisoners in the complex, of which 355 escaped during the attack. The government said 148 of the escapees "were threats to national security." An Afghan interior ministry statement in Kabul says seven security guards were killed and seven were wounded. It also says that five insurgents were killed. In a statement emailed to reporters, Taliban spokesman Zabihullah Mujahid claimed responsibility for the attack, alleging the prison was being run by the Afghan intelligence agency, and saying the inmates, including Taliban fighters, were being severely mistreated. In a second statement, the Taliban claims that senior commanders and fighters of the group are among those freed from the jail in Ghazni province.